I purchased a set of two Hello Kitty vegetable cutters with stamps recently. They are a great size for mini sandwiches. I made Rose & Amy almost identical Hello Kitty lunches. They were thrilled! Time to vote on Bento Blog Network! 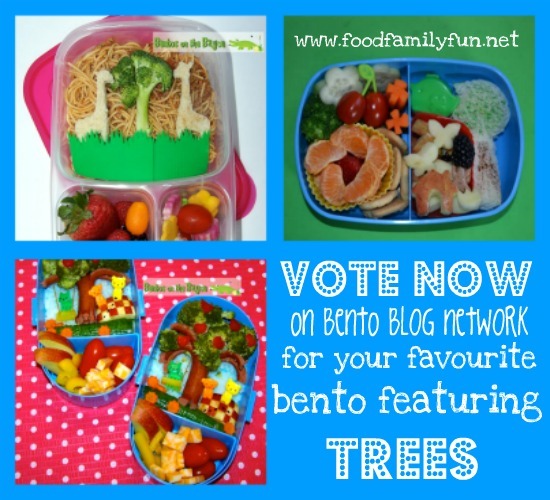 The theme this week is trees on Bento Blog Network. There is only 1 vote per IP this week. It's going to be hard to choose! 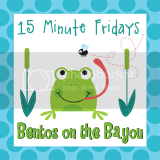 In the photo below, the top right is my entry (#16 in the list) and the 2 on the left are from Bentos on the Bayou. Click on the photo to get to the voting site. 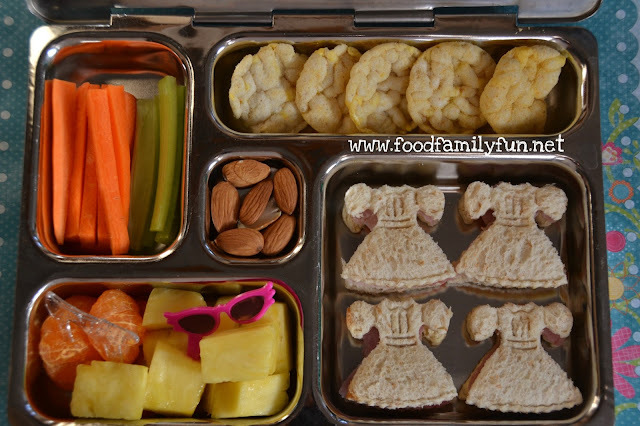 A simple, healthy lunch packed for Rose. The cheese topper really was fast to make. I used a cute little set that I have had for ages. You can make lots of fun layered designs with it. I packed myself a simple veggie lunch for a busy day. It definitely helps me to eat properly when I pack lunch early on a busy day. Time gets away from me and I actually forget to eat when I am working!?! Then before I know it I'm starving and on the verge of low blood sugar. 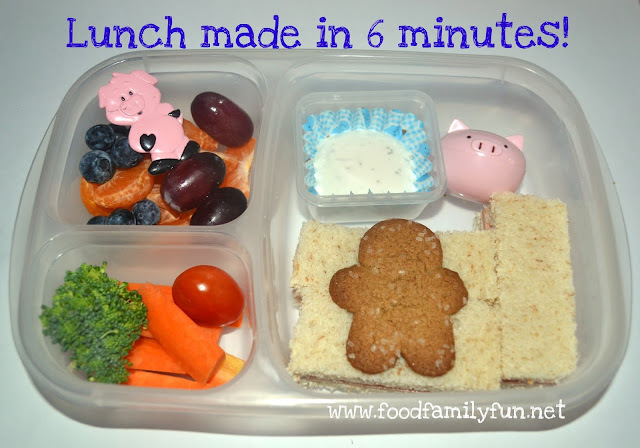 If my lunch is all ready to eat, it certainly motivates me to eat on time. A fun dress up lunch for Amy. This was super simple to make. It literally took just a few minutes. Amy loved it! These plunger style cookie cutters are so fun and easy to use. All 4 were made from 2 slices of bread. First I cut out all of the bread and stamped 4 of the best looking slices with the dress details. Then I cut out the ham and assembled. Easy! Quack! Quack! 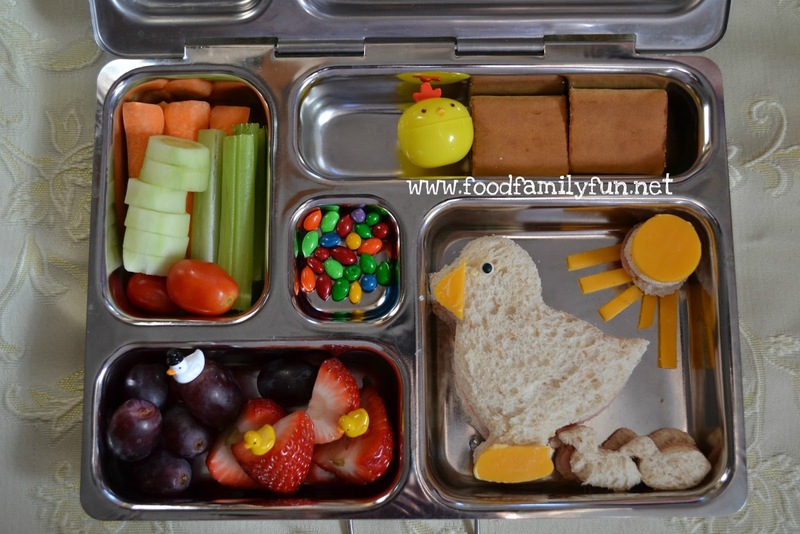 A fun little ducky lunch for Rose from last week. 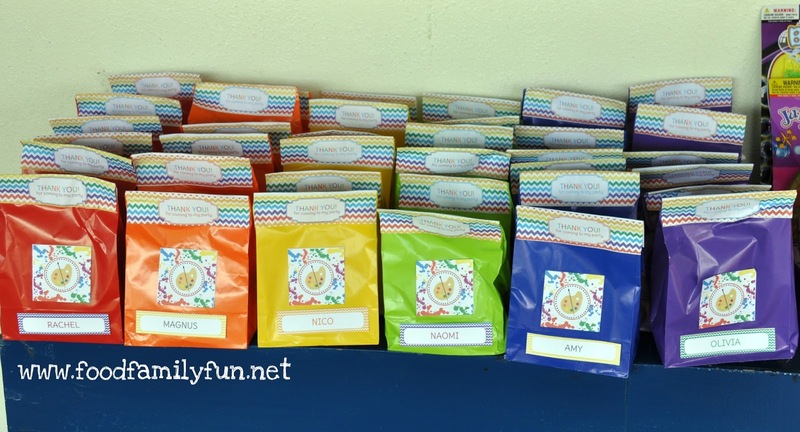 candy coated sunflower seeds, 2 vitamins in the little chick container. 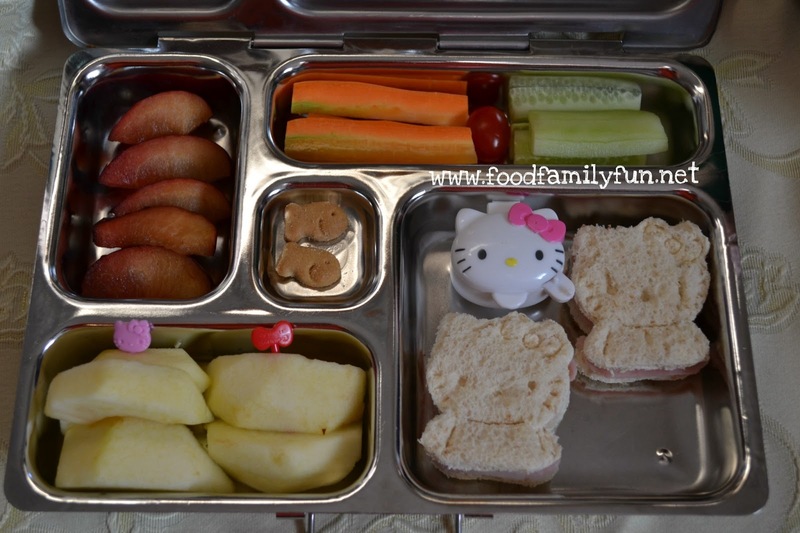 Mommy duck, baby duck and sun ham sandwiches. 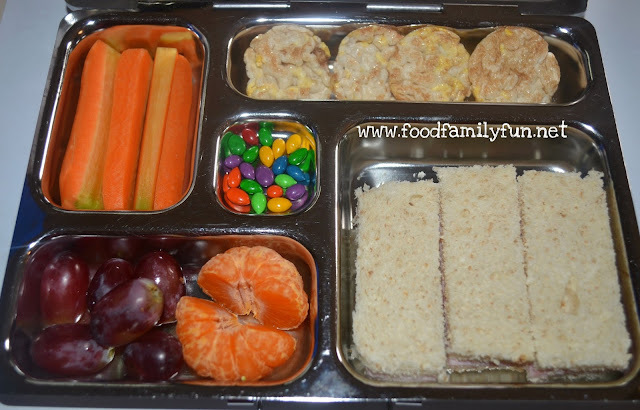 I have loads of lunches to post from the last couple of weeks. I have been so busy with work and school that I just haven't had a chance to post them. We still have several weeks of school left but it already feels like summer vacation because the weather has been great! 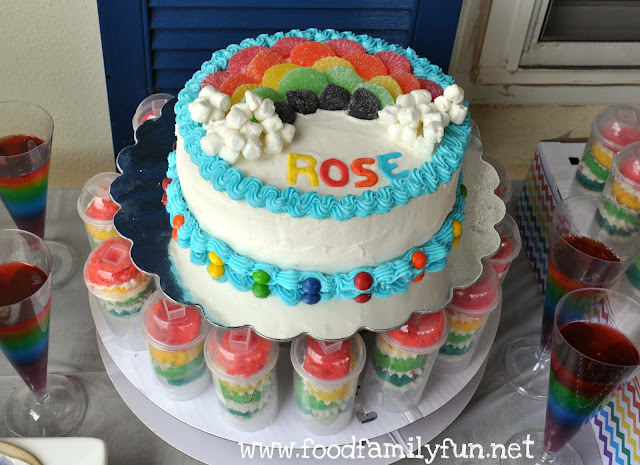 Amy & Rose had a great time at their birthday party! They wanted a rainbow art theme so I got to work scouring the internet for fun ideas. 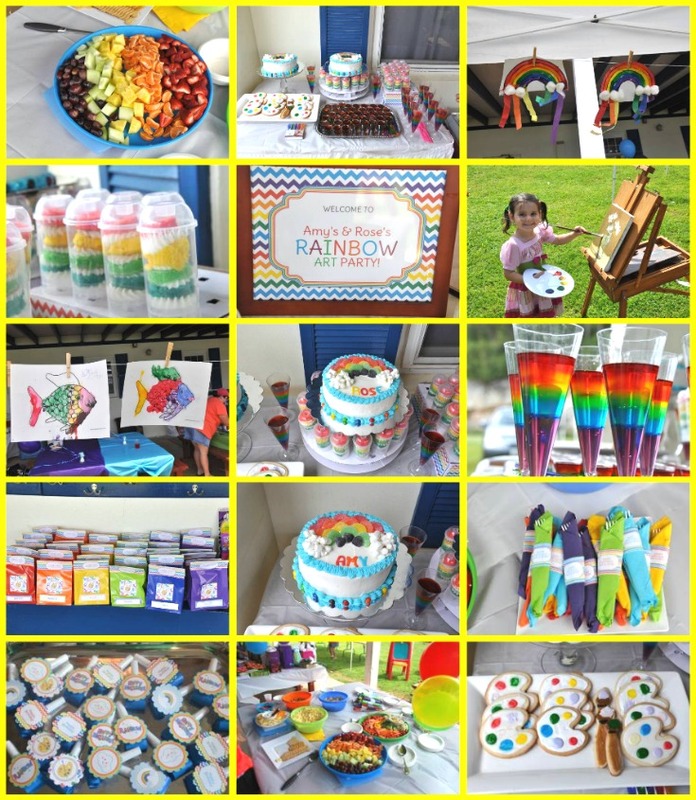 This was a party on a budget so we went with simple food (all homemade) and easy crafts made from items we already had on hand. First up the cakes. I went with super simple. Plain vanilla cake on the inside for both girls. It's their favourite. 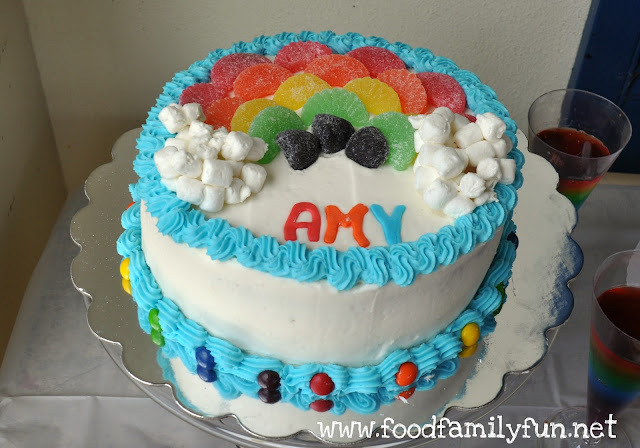 I had wanted to have some sort of rainbow decoration on the cakes but hadn't really planned it out. Rare for me since I'm usually all about the cake. I did a quick internet search and found this video. Perfectly easy and fast. I had made some fondant and just cut their name out. I had a little cake stand accident at the party. When taking both of the cake stands out of the car I accidentally bumped them together and broke one! I was devastated. The party was held at the school playground so I improvised very quickly and used one of the cardboard cake push-pop stands instead. It was only meant to hold extra cake push pops and wasn't decorated or anything but it worked out OK. I did have a little fun with cake. I tried push pops for the first time. It was super simple. I decided to only use 4 colours to make it easy. I think they came out pretty cute and they were tasty too! The kids just loved these. I will definitely make them again. Rainbow Jello cups. I was totally going to leave these out and not make them but at the last minute I went for it. They just look so pretty! I actually made about 50 plastic shot glass sized ones for the kids. I used one regular sized package of each jello colour. 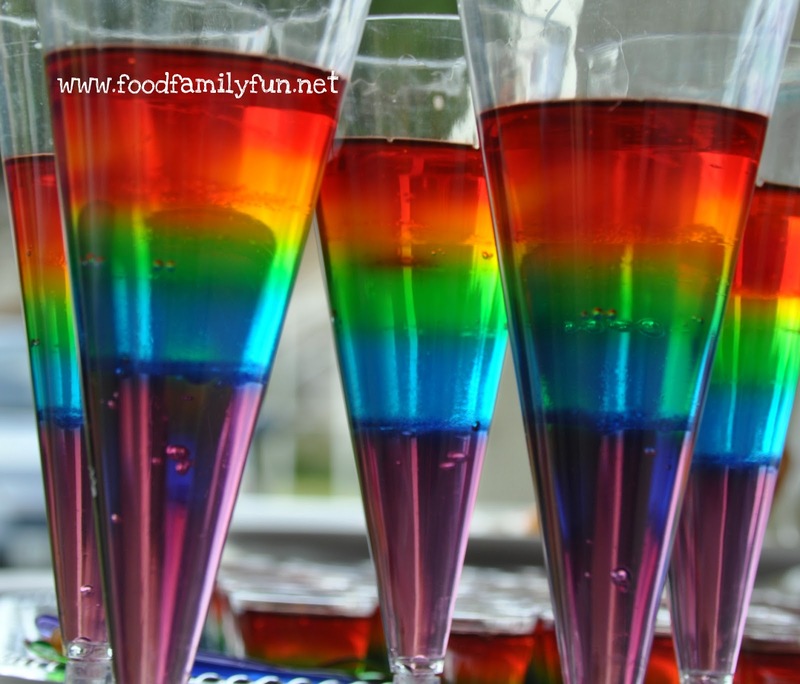 There was still plenty of Jello left so I made these taller glass ones with some plastic party glasses that I had leftover from a previous occasion.These are time consuming to make since you need to let each layer semi set for about 10 minutes so it takes a while to get all of the layers made. It's not difficult, just tedious. 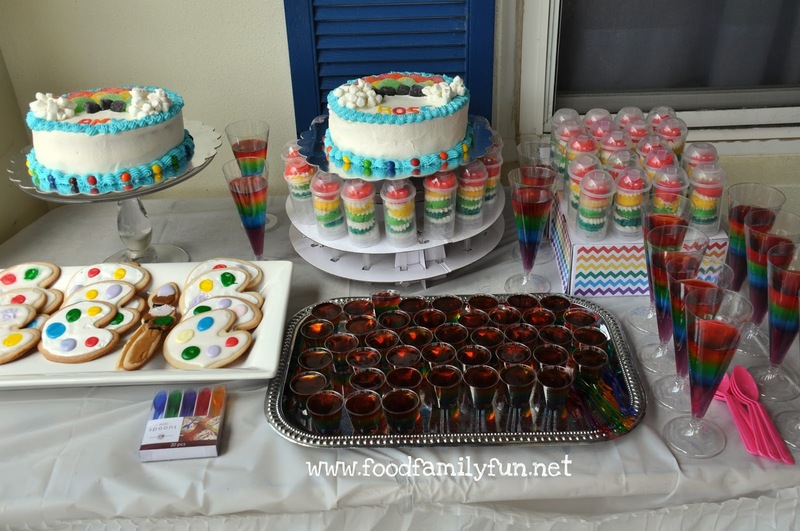 Here's the party dessert table. 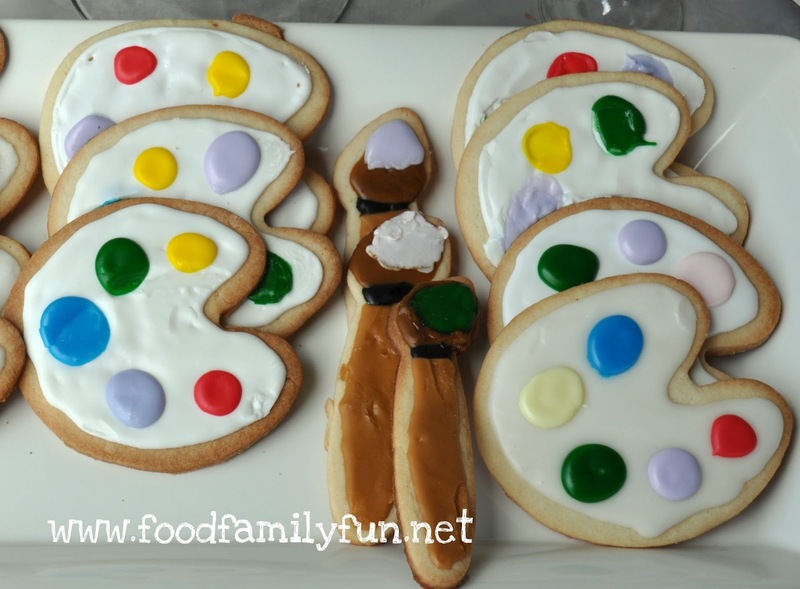 I also made some paintbrush and palette cookies. My husband and I decorated them the morning of the party. They kind of stuck together a bit during transport since they didn't have quite enough time for the icing to dry fully. They were delicious though! 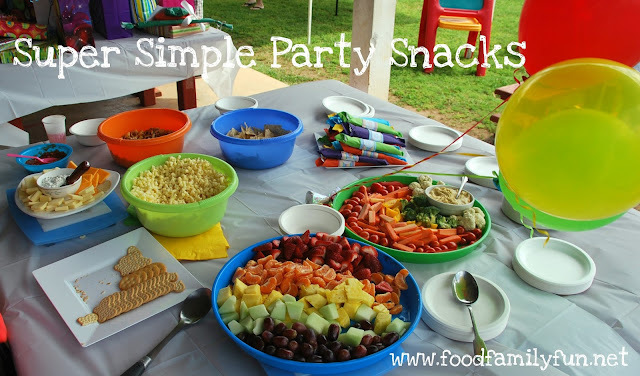 The rest of the party food was super simple. It was a late afternoon party - so I just served a few snacks. The veggies are arranged like a rainbow with cauliflower clouds, and the the fruit is a rainbow stripe. In addition, I just put out a little cheese & crackers, chips, popcorn twists etc. My Aunt really came to the rescue on the morning of the party. She ended up cutting up all of the fruit and veggies! My Mom also helped with baby duty and watched the all of the girls while Ozzie & I were in full party preparation mode. As usual, I was a bit behind schedule at the last minute. Having a party off site with so many little extras meant it took a while to get packed into the car and then setup. It's much simpler to be at home and take stuff out to the tables at leisure. Rose wanted to invite her entire class so we chose the playground because of easy parking and lots of space. It was a good decision, but now I have a better idea of setup time etc for an offsite location. I had forgotten to take a photo of the food right away so you might notice a few nibbles out of the trays already. 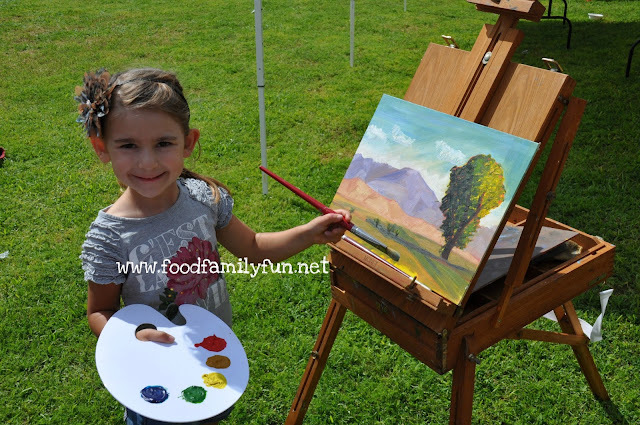 We had several crafts/activites on hand. 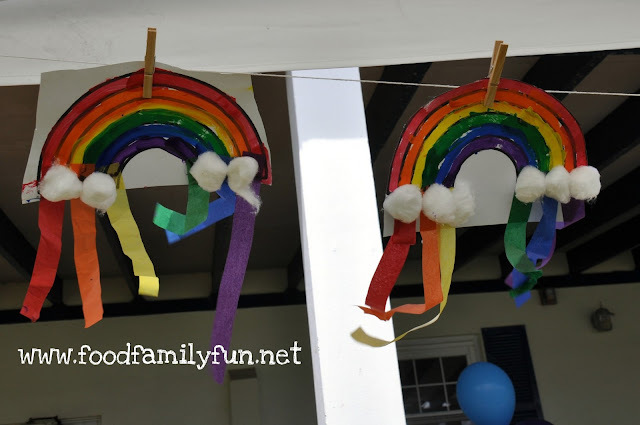 Make a collage, paint a rainbow fish, make a hanging rainbow with tissue streamers and some colouring sheets. Here are just a couple of some finished pieces. We hung them up in a tent for our little art gallery and also so that they could all dry. It was a windy day so this was a good idea. If we would have just laid them out on the table to dry many would have blown away! I also setup a little staged photo for the children. My Aunt brought over her easel, some paintings and some brushes and a palette. We let the children choose a painting and then took a photo of them as if they were painting it themselves. The party guests were ages 3-7. 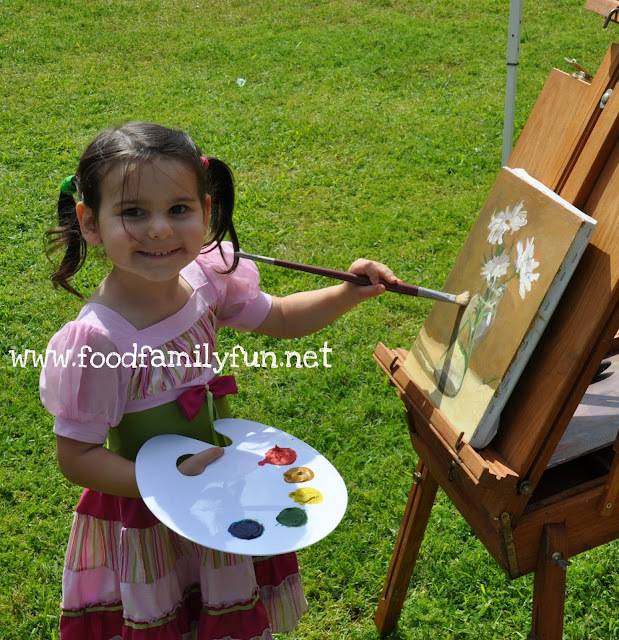 I thought only the littles would be interested in this activity but almost everyone lined up for their turn. They really got a kick out of it! Here are my girls' artist photos. 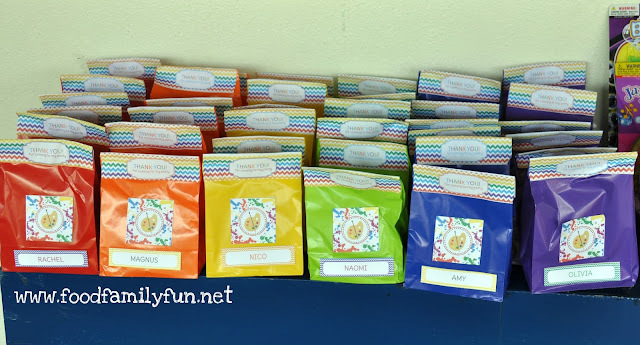 Party bags were very simple for the party. 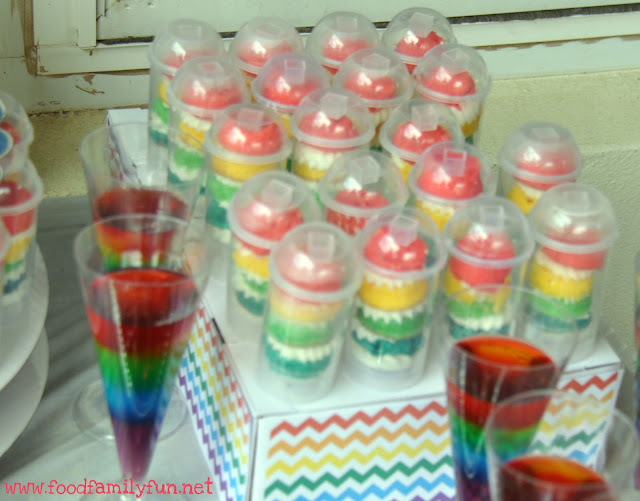 They held a few goodies and I made them in a rainbow of colours. I also decorated party blowouts as one of the items inside each one. 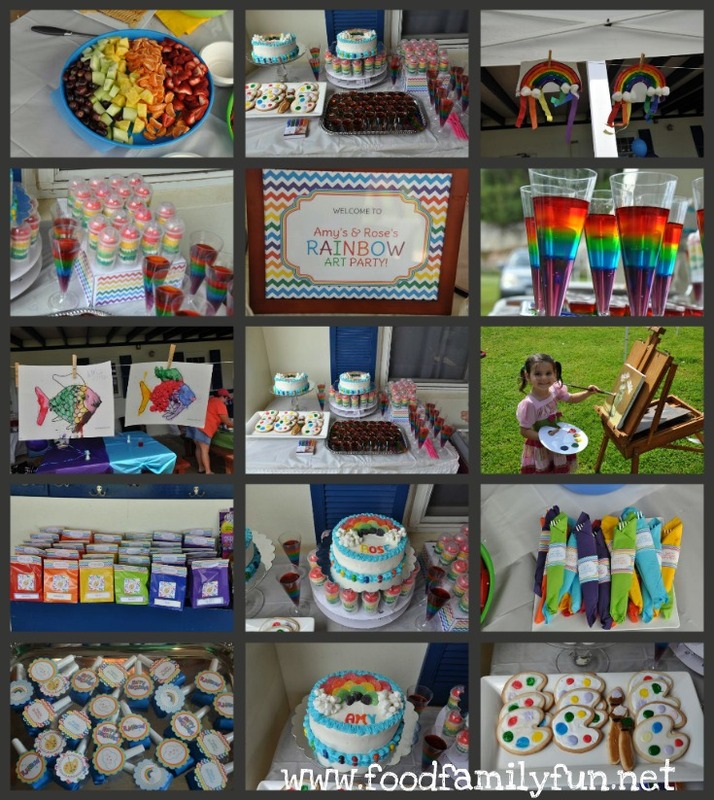 I prefer not to put photos with other children on my blog but I can assure you there were lots of smiling faces during the party. The children had fun playing on the playground, creating some fun art, playing football (soccer) and playing pass the parcel. 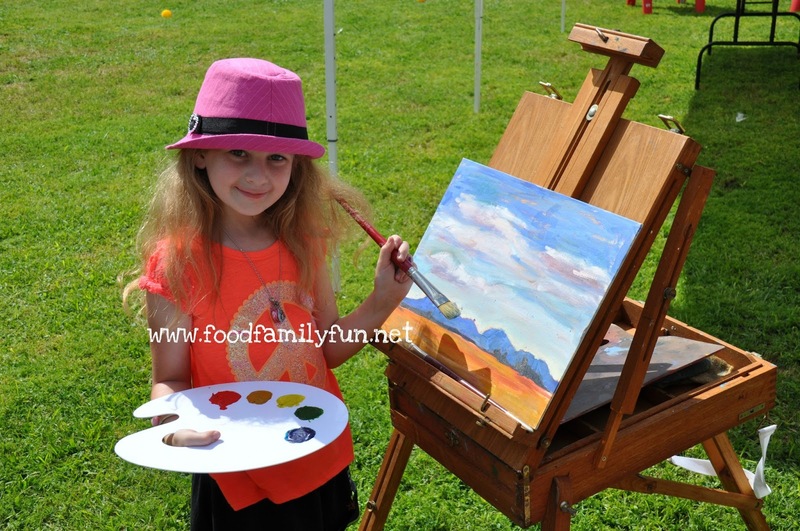 My girls had to wait a few weeks after their birthday for their party because the school playground was fully booked, but they will tell you that it was worth it! Thank you to everyone who came and made their party a success! 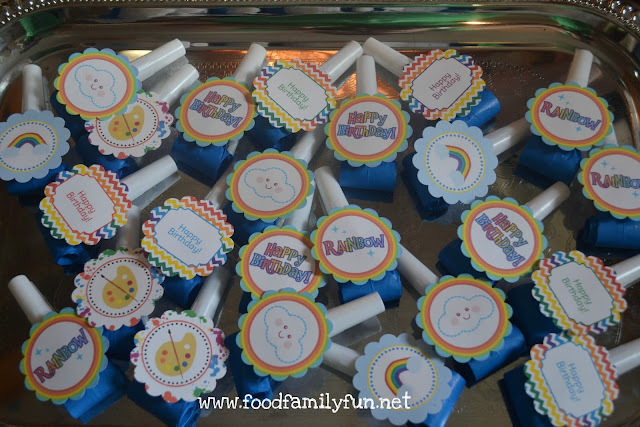 I used a couple of different party printable sets for this party. I liked elements of all of them. They can be found here. I have no affiliation with these designers. 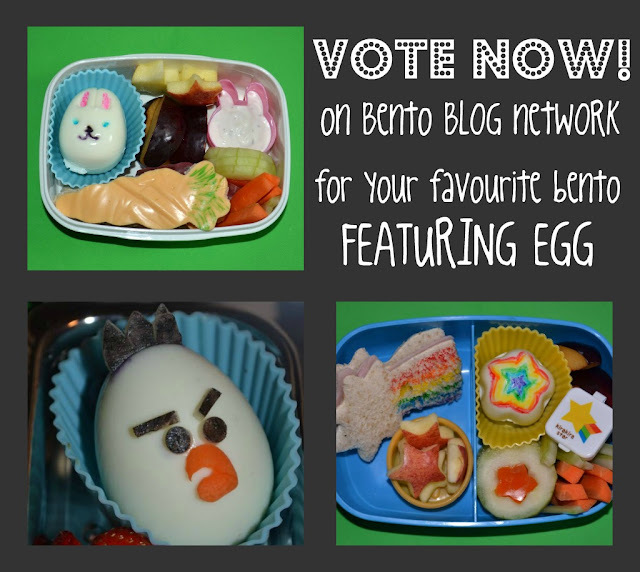 Time to Vote on Bento Blog Network for your favourite bento featuring egg. Voting ends on Thursday and the winner is announced on Friday. There are 4 votes allowed per IP address. There are some really fab entries again this week! These are all of my entries shown above. Click the links if you want to see the full posts. I had forgotten to make Heidi's lunch in the morning. It was just one of those days and I got sidetracked. 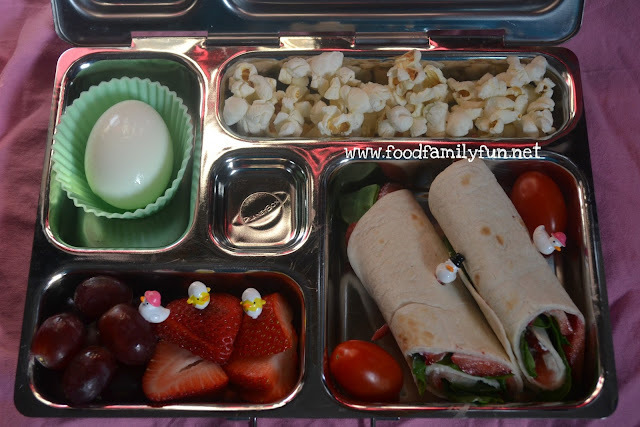 I made lunches for Amy & Rose who were taking theirs to school, and didn't get back to make a third. As soon as Heidi came home from school her usual - "What's for lunch?" routine started and I had to move quickly. The whole thing took under 6 minutes. The longest time was peeling the clementine and peeling the carrot. All of the rest was pretty speedy to put together. If I had made this in the morning I would have put the lid on the ranch dip cup, since I was making it to eat right then, I left it as is. I often just put dip right in there with the carrots at lunch time if she asks, but I was hoping that she would try the broccoli and I wanted her to choose about dip or no dip. Well she didn't touch the broccoli or the tomato and also left a few blueberries. Otherwise it was a successful lunch, packed really quickly with a hungry 3 year old biting at the ankles. And yes - she ate the cookie first. Can't blame her -I would have too! Fast lunch, easily packed in a Planetbox. 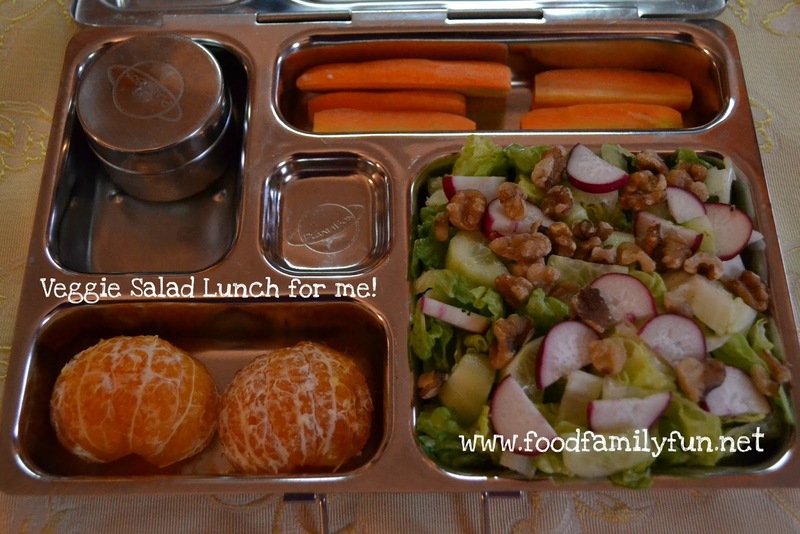 A very simple and fast lunch packed in a Planetbox. This was for Amy. You know those mornings where it's just so difficult to get moving? This was one of those days. I seem to have them a lot lately! We all really love those sunflower seeds. The ONLY place I have found them locally is at Treats. They're $15.99 a pound! Yikes! They'll have to be a special treat. It's a good thing that we all like plain sunflower seeds too. I made this lunch without any fancy bits (not even a pick!?!) and it was super fast to pack. Happy Star Wars Day! 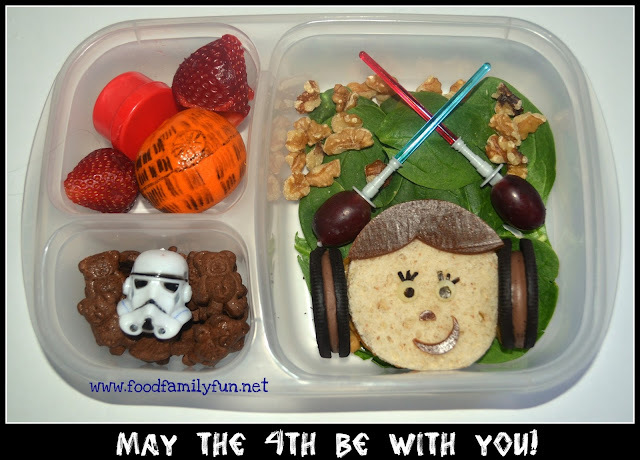 This fun Star Wars themed lunch is for me! Simple healthy lunch for Rose. This wrap was a new item for Rose. She ate one half and said next time leave out the strawberries! I thought for sure she would have said no spinach. So I'm pleasantly surprised. I put plenty of extras in her lunch just in case she didn't like the wrap. I hadn't tried it at home first. This recipe was a MOMables recipe - I just tweaked it to make it vegetarian. I enjoy my MOMables subscription so far. It's nice to see so many lunch choices each week! It certainly makes me want to try something new. 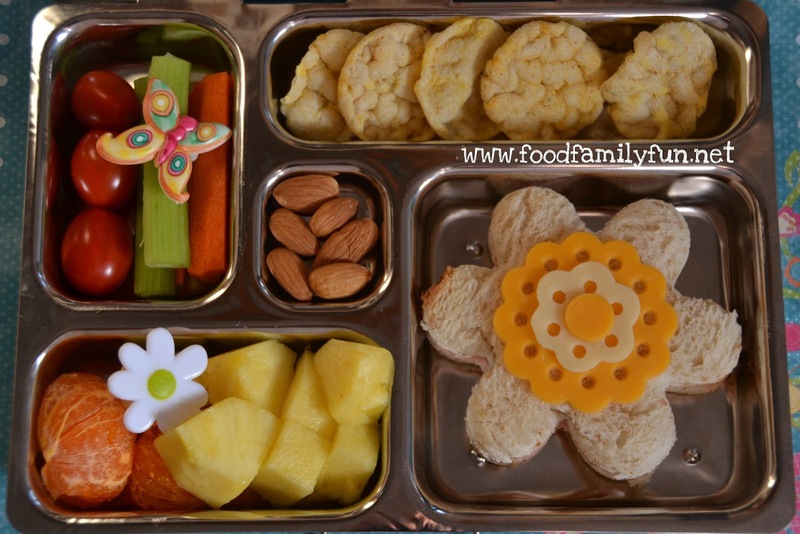 Vote now for your favourite bento featuring NORI! It's that time again! 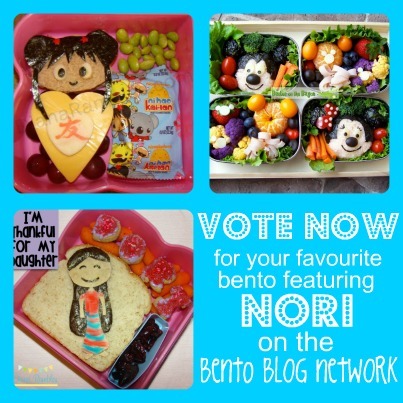 Voting has begun on the Bento Blog Network for this week's theme - bento featuring nori. Voting is Wednesday & Thursday only. Winner is announced on Friday. I haven't entered any of my own lunches this week but there are so many fantastic ones to choose from! There are 2 votes allowed per IP. I could hardly narrow it down to two favourites myself. 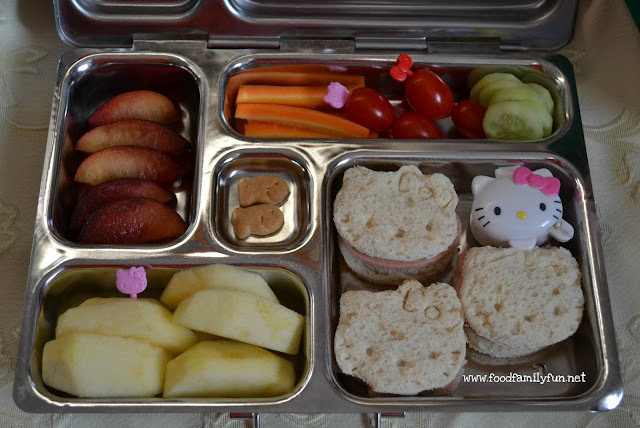 The bento pictures above are entries from Diana Rambles (Kai Lan & thankful for my daughter), & Bentos on the Bayou (Mickey & Minnie). Here are the upcoming themes for Bento of the Week if you would like to enter yours next time there is plenty of time to plan!